In spite of the fact that he very much advanced in age, the passing of Second Republic President of Nigeria, Alhaji Shehu Shagari, on Friday 28th December did not neglect to inspire responses of disappointment and distress over a wide range of the Nigerian people. The purpose behind this isn’t far to look for. Shehu Shagari The modest and unassuming senior statesman was a noteworthy member in the history making procedures of Nigeria’s improvement appropriate from the First Republic to the day he in the end surrendered to the chilly hands of death at the age of 93. Shehu Usman Shagari was born in 1925 in Shagari village founded by his great-grandfather, Ahmadu Rufa’i, who was also the Village Head, and took the name Shagari as his family name. His father’s name was Aliyu and his mother’s name was Mariamu. Shagari started his education in a Quranic school and then went to live with relatives at a nearby town, where, between 1931 and 1935, he attended Yabo Elementary School; and between 1936 and 1940, he went to Sokoto for middle school, and then from 1941-1944, he attended Kaduna College. Between 1944 and 1952, Shagari attended the Teacher Training College, in Zaria, Kaduna State;and from 1953-1958, he worked as a visiting teacher at Sokoto Province. He was also a member of the Federal Scholarship Board from 1954-1958. According to the Wiki citation on him, the late ex-president entered politics in 1951 when he became the secretary of the Northern People’s Congress in Sokoto, Nigeria, a position he held until 1956. General Olusegun Obasanjo, who was military Head of State had handed over to Shagari in 1979, and he was in office till 1983. Before then, Shagari had served as a federal minister and federal commissioner between 1958 and 1975. Shagari was made the Turaki of the Fula Sokoto Caliphate in 1962 by the Sultan of Sokoto, Siddiq Abubakar III. He worked as a teacher for a brief period before entering politics in 1951 and, in 1954, he was elected to the federal House of Representatives representing Sokoto West. In 1958, he was appointed as parliamentary secretary — a post he left in 1959 for Prime Minister Abubakar Tafawa Balewa. He later served as the Federal Minister for Commerce and Industries. Between 1959 and 1960, Shagari was made the Federal Minister for Economic Development. Between 1960 and 1962, he was moved to the Pensions Ministry as the Federal Minister for Pensions. From 1962-1965, he became the Federal Minister for Internal Affairs. And from 1965 up until the first military coup in January 1966, Shagari was the Federal Minister for Works. In 1967, he was appointed the Secretary for Sokoto Province Education Development Fund. From 1968-1969, he served as Commissioner for Establishments. After the civil war, from 1970-1971, he was appointed by then military head of state Gen. Yakubu Gowon as the federal Commissioner for Economic Development, Rehabilitation and Reconstruction. In 1978, he became a founding member of the National Peoples Party. In 1979, Shagari was chosen by the party as the presidential candidate for general election that year, which he won, becoming the president. 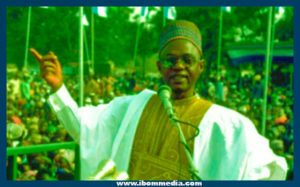 Shagari ran for a second four-year term in 1983 and won the general election. However, on 31 December 1983, he was overthrown by then Maj. -Gen. Muhammadu Buhari. He was Grand Commander of the Order of the Federal Republic, GCFR. Can I ask if you will be interested to know “how your website soccershell.com can be setup with some Ninja LinkedIn marketing technique that will pull in tons of qualified leads everyday for your business on autopilot basis…” ? You dont Require any knowledge of html. I have an ebook rom a friend that will be of help to you.